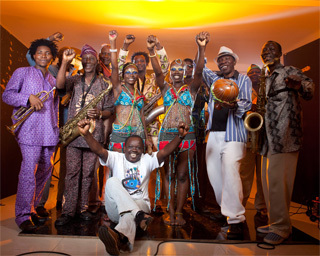 I went to a great concert last night - an African band called Egypt 80, led by singer Seun Kuti. I knew nothing about them and wasn't sure what to expect but it was fab! After fueling up with a big bowl of ramen noodles at a very local, low key ramen shop, we trotted down to the venue which was at Club Quattro in Shibuya. It was very small and hot and there was a great atmosphere, with about 15 musicians on a tiny stage - three trumpeters, two sax players, several drummers, keyboard etc. It was great for the soul.